"Our son pulled Eli's glasses off of his face and threw them in the apple tree. I can't find them. Please advise." And we searched and searched. It was like you had found a magic black hole in our backyard for the glasses. They are still missing. There is so much sweetness in you. 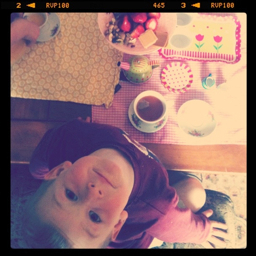 You love a good tea party. You honestly believe that you make kisses and hugs while you sleep and that you're out of them at bedtime. Then you'll slyly ask if I'm going to steal a kiss and I can see that you're hoping I will. You made up a song, "My daddy was a farmer when he was born and he toots and he puffs all day long." You're clearly a poet. You are more than my wild boy. You call your baby sister Missy and Roofie and you kiss her constantly. You are able to be gentle. Yet, when the big boys come around you puff up your chest and pull glasses from faces, thinking that is what it is to be big. I have so much to teach you but I don't know the first thing about being a man. I am ill equipped and still searching for glasses. I think you should walk outside the fence and see if they miraculously made it over. Because of your sweet boy Eli will finally be getting the new glasses that are way overdue. Thanks friend!